Congratulations, Jess! Expect an email from me asking for your mailing address. I'll be attending Dianne's book launch this Saturday, January 31st and will buy your copy then. 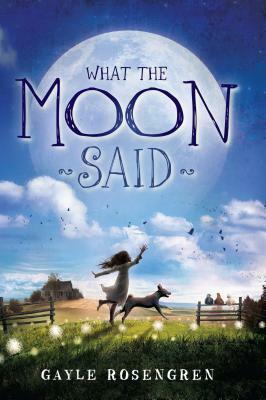 Now for some Newbery talk in honor of the 2015 ALA Youth Media Awards, which will be announced one week from today, at 8 am Central Time on Monday February 2nd. 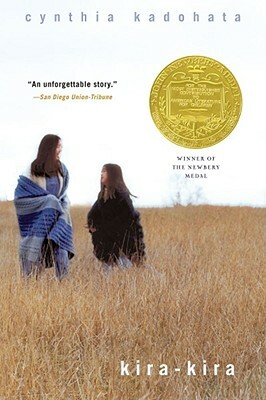 Back in October, I mentioned in this post that I had read 60 Newbery medal winners. 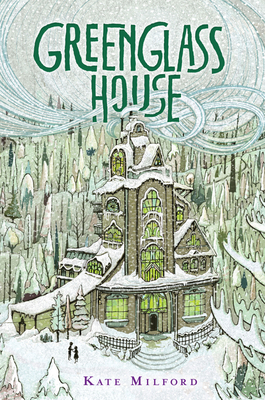 (Here's a link to the Buzzfeed Newbery test if you haven't taken it). Well, I'm happy to report that I can update that total once again. Thanks to my local library, I've now read 67. I believe Ms. Yingling has read all 93 of them (Congrats, Karen! ), though I don't know how she did it, because some of those older books are, um, a bit slow (I tried to read Hitty, The First 100 Years. I really did. I think the cramped font put me off too). Katie Takeshima's big sister, Lynn, makes everything seem kira-kira, or glittering, shining. It's the 1950s and the family moves from Iowa to rural Georgia, where Katie's parents work long hours in a poultry plant and hatchery. This isn't so much a book about prejudice (although that's a big part of it) as it is a haunting and achingly beautiful look at how the death of a loved one tears apart an entire family. It's up to Katie to remind her family there is still kira-kira in the future. I'd always put off reading this because I was afraid it would be dry and boring. I was wrong. Told in first person, this novel is based on the life of the painter Velasquez and his slave, Juan de Pareja, who became a respected artist in his own right. In seventeenth-century Spain it was forbidden for slaves to practice the arts, so Juan resorts to stealing colors and painting in secret, despite knowing he could be killed for it. A great novel about the injustice of slavery. 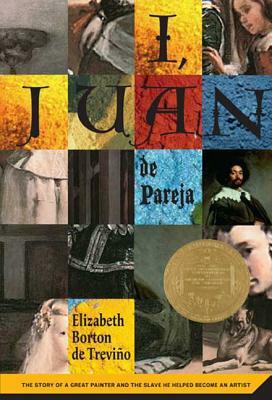 I also loved the richness of the writing, with a tapestry of colorful details that brought Juan's world vividly to life. According to Wikipedia, Phyllis Reynolds Naylor completed the first draft of this novel in a mere eight weeks! Yet it's become a modern classic. 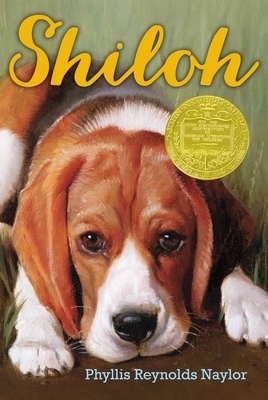 Published in 1991 and set in West Virginia, this touching story of Marty and the dog he rescues must be one of the first MG books to talk about animal abuse (unless you can think of another?). And don't worry, it has a happy ending. What book do you hope will win this year's Newbery medal? Brown Girl Dreaming by Jacqueline Woodson is getting a lot of Newbery buzz, so I won't be at all surprised if it wins. I've only predicted the gold correctly one time (the year When You Reach Me won). Maybe I'd have better luck trying to predict honor books. This year, I'm hoping the Newbery committee gives some love to Hope is a Ferris Wheel by Robin Herrera, The Secret Hum of a Daisy by Tracy Holczer, and El Deafo by Cece Bell. 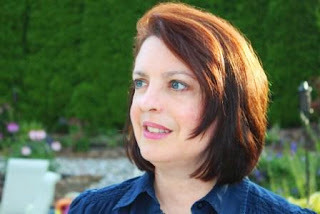 Guest Post from Dianne Salerni for The Inquisitor's Mark (coming soon!) - and a giveaway! Synopsis: When a mysterious man claiming to be Jax Aubrey's uncle kidnaps his best friend, Billy, Jax fears a trap. Before his father died, he never mentioned having a brother. Enemy Kin leaders and corrupt Transitioners are after Jax's guardian, Riley, the sought-after descendant of King Arthur, and his liege lady, Evangeline, a powerful magician descended from Merlin. To protect them Jax sneaks off to New York City by himself to rescue Billy. And it's a trap all right. 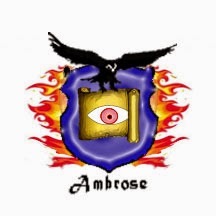 Jax learns his real last name is Ambrose, not Aubrey. And his new-found relatives will stop at nothing to get what they want. Why I recommend it: As exciting as The Eighth Day was, this second book in the series ratchets up the tension even more. You'll be racing through the pages to find out what happens. Jax has to call on all his resources to handle not only his nasty new relatives, but an enormous and deadly creature he's never seen before. When I sat down to plan and write The Inquisitor’s Mark, I remember feeling overwhelmed and nervous. It was the first time I’d ever had to write a book that was already sold, sight unseen, before it existed. HarperCollins had bought The Eighth Day and expected me to write at least two more books in the series. They believed I could, and I REALLY hoped their faith in me was well-founded! As it turned out, this book was my favorite one to write in the series so far. (Writing Book 3 made me pull my hair out, but that’s another story …) What was fun about The Inquisitor’s Mark was that the personalities of the central characters were already established – at least up to the point where I left them in Book 1 – but since people change and grow in real life, I knew these characters would do the same. For example, at the beginning of the first book, Jax loathed his 18-year-old guardian, Riley, but by the end, his opinion had changed. This is touched upon in several places, but with the whole We-Have-To-Save-The-World thing going on in the climax, there wasn’t a lot of time to fully explore it. Therefore, it was very rewarding to have the time in the early chapters of The Inquisitor’s Mark to play with this developing brotherly relationship, including the normal teasing and rough-housing one might expect between boys. “I thought all you had up your sleeves were tattoos,” Jax said. Riley made sure Evangeline wasn’t looking, then smacked Jax in the back of the head. Of course, you can’t keep up the tension if things are going great, so Jax overhears Riley planning to send him away for his own good and Mrs. Crandall urging Riley to break up the vassal-liege bond between Jax and Evangeline before Jax gets hurt … and suddenly Jax doesn’t know his place in the group anymore. Enter the new characters – who were another favorite part of writing this sequel. Jax has a family, as it turns out: an uncle, cousins, and grand-parents. Too bad they belong to the Dulac clan, the powerful and corrupt people who assassinated Riley’s family and would like to see Riley dead too! The dynamics of meeting these people – blood relatives and also enemies – was massively fun to write as an author, while incredibly difficult for poor Jax. I particularly enjoyed the character of Jax’s uncle, Finn Ambrose. He’s the right-hand man of the evil Ursula Dulac and definitely a “bad guy,” but he loved his brother Rayne, and he sincerely wants to provide a home for his long-lost nephew. How does a 13-year-old boy deal with a man who, on one hand, wants him to betray his friends, but on the other hand, looks so much like his father? Jax grinned. And his uncle grinned back. That provides a wealth of material for an author to work with! Thanks, Dianne! I'm truly impressed that you wrote the rough draft in eleven weeks. Readers, The Inquisitor's Mark pubs on January 27, 2015. And if you haven't read The Eighth Day yet (and why haven't you???) the paperback is now available! For this giveaway, I will be purchasing a hardcover copy of The Inquisitor's Mark for Dianne to sign in a few weeks. To enter simply be a follower and leave a comment on this post. If you tweet about the giveaway or mention on facebook, let me know and I'll give you extra entries. US and Canadian mailing addresses only. This giveaway ends at 10 pm on Sunday January 25, 2015. And the winner will be announced on Monday January 26. 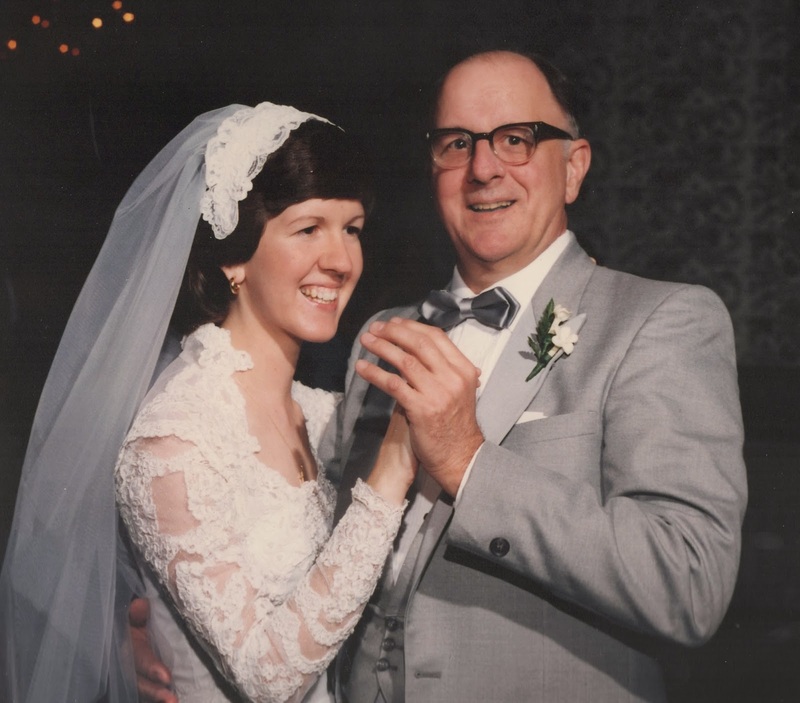 Apologies for the long silence (and for not visiting all your blogs) but my father's illness took up a lot of my time toward the end of 2014. My facebook friends already know this, but my father passed away on December 11, 2014, exactly two weeks before Christmas. Those two weeks are mostly a blur at this point, but we did manage to celebrate Christmas, although of course the tears flowed freely. Looking through my myriad photo albums, I realized I have many wonderful pictures of my father to help me remember him. This one is from my wedding, nearly 30 years ago. 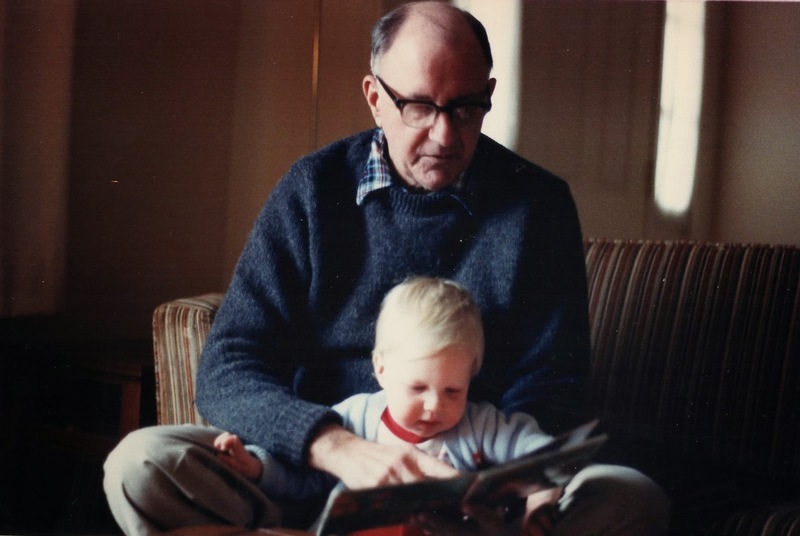 One of my favorite memories of Dad is when he read to me or told me stories. He was terrific at all the voices. Years later, he continued the tradition by reading to my sons. So you can see that books have always been an important part of our family. For a book blogger, of course, the end of the year means looking back to see how many books I read. What about you? Did you reach your reading goals? Do you have any favorite books from 2014? In 2014, I read 108 books, eleven fewer than the year before, but five more than in 2012. And although I do read adult books from time to time (I read Joan Didion's memoir, The Year of Magical Thinking, and cried through the entire book), mostly what I read is MG. Here are a few MG titles that gave me comfort these last few weeks (and which I highly recommend). Source for all was my local library and all synopses are from Indiebound. Synopsis: Thanks to her superstitious mother, Esther knows some tricks for avoiding bad luck: toss salt over your left shoulder, never button your shirt crooked, and avoid black cats. But even luck can't keep her family safe from the Great Depression. When Pa loses his job, Esther's family leaves their comfy Chicago life behind for a farm in Wisconsin. Living on a farm comes with lots of hard work, but Esther makes a fast friend in lively Bethany. But then Ma sees a sign that Esther just knows is wrong. If believing a superstition makes you miserable, how can that be good luck? My take: You may remember that I adore books about the Great Depression and this is no exception. A lovely story. Simply lovely. 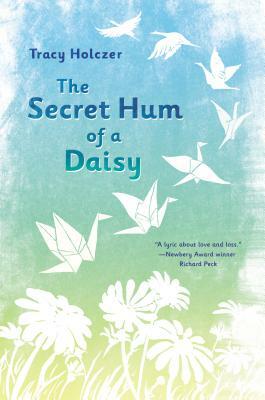 Synopsis: After her mother's sudden death, Grace is forced to live with a grandmother she's never met. She can't imagine her mother would want her to stay with this stranger. Then Grace finds clues in a mysterious treasure hunt, just like the ones her mother used to send her on. Maybe it is her mother, showing her the way to her true home. My take: Since I read this the week after my father died, I found it extremely comforting. But I also loved Grace. She seemed so flawed and vulnerable and real and she really grew as a character. 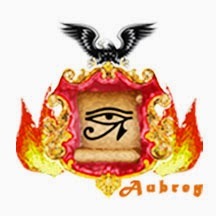 Synopsis: A rambling old smuggler's inn, a strange map, an attic packed with treasures, squabbling guests, theft, friendship, and an unusual haunting mark this smart mystery in the tradition of the Mysterious Benedict Society books. My take: The synopsis doesn't begin to do justice to this entertaining, many-layered, deftly-woven tale that takes place just before Christmas (I read it just before and after Christmas so it was perfect!). Milo is an orphan, raised by loving adoptive parents who just happen to run a smuggler's inn. I totally guessed the "secret" of this book less than halfway through, but highly doubt an 11-year-old would. I also think it would make a terrific graphic novel. 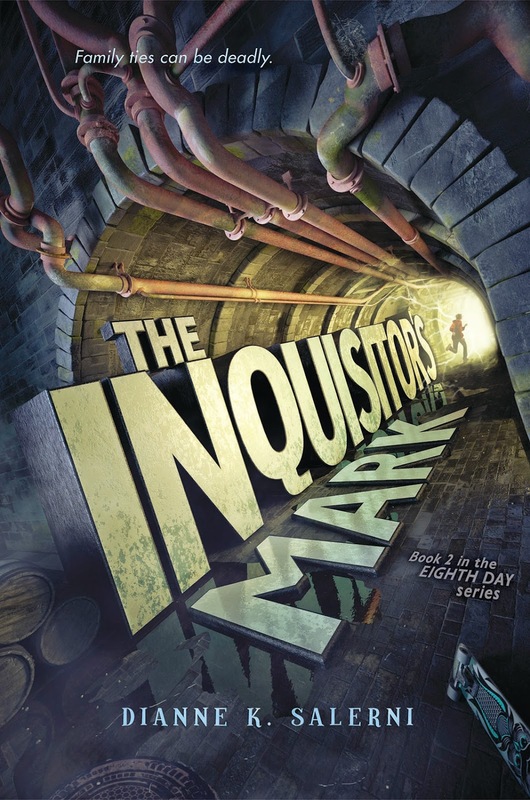 Next week: A giveaway and guest post from author Dianne K. Salerni, whose book, The Inquisitor's Mark (a sequel to The Eighth Day) comes out on January 27, 2015.